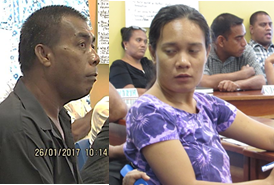 8 Feb. 2017—The Mayor of Tamana, Eken Taumauri and his Clerk Teauatara Viriona, visited KiLGA to discuss investment options for surplus Council funds and other issues including new and alternative sources of revenues to meet a wage increase for its employees in compliance with the minimum wage law, the updating of the Council’s bye-laws to allow for new a fee structure on motorcycle licence, creating a new policy directing all visiting officials from government divisions, projects or SOEs to include a Council official in its selection panel for recruitment done on Tamana, upgrading of preschools staff and infrastructure in preparation for the Early Childhood Care & Education (ECCE) Act implementation, and others. The Mayor showed his keenness to provide a leadership to elevate the Council’s status and standard of services. This is demonstrated by his ideas such as getting KiLGA to facilitate and coordinate good practices sharing among Council leaders, making plans to celebrate his Council’s 50th Anniversary, making Councillors come to work in line with salaries to be paid by government and others. New changes have taken place on the island since the Mayor took over, including the involvement of government workers in all Council consultations, renovation of dilapidated Council buildings for use, empowerment of the ‘Kamweraoi’ (Welfare) Committee to improve WASH standards on the island, and many more.